The first fully-electric Mercedes vehicle is to debut in the UK next year. The all-new B-Class will be packed with DriveTrain technology – a system spearheaded by Tesla that will feature in the latest electric car to cause a ripple in the market. An association with the world’s most famous electric car manufacturer is unlikely to do Mercedes any harm. Mercedes could hardly have picked a better fantastic partner when making your initial forays into the electric market. Recently, news has filtered that electric car sales are making a sharp rise, and Mercedes will be looking to capitalise on this in 2015. The 5,000 plug-in car grant – much famed for its contribution to cleaner roads - will be employed, allowing the car to act as an attractive proposition to families looking to go green. So how much charge-time can you realistically expect? Well, Mercedes have suggested that a range of upto 120 miles will be able to be covered between charges. A charge plan that should cater for a large proportion of UK motorists. 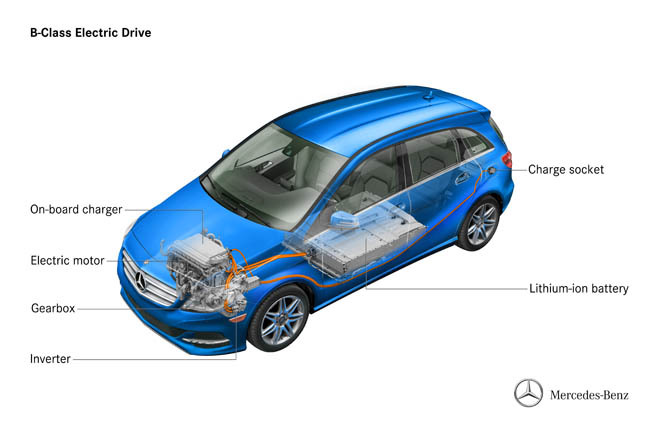 However, home charging solutions will NOT be included with the B-Class Electric Drive, meaning customers will have to source a charger that can be wall-mounted from an energy supplier of their choosing. The car will have a charging speed of 11 killowatts, requiring three hours to fill the 28kWh battery. Despite some shortcomings, perhaps highlighted by the strength of the current electric car market – Mercedes will be hoping to cause a splash. And the reputable brand name goes a long way in the UK market. Watch this space.